Ok, I know it's been done before but I had to share my Mother and Daughter shoe gardens. Mom passed away last year and I found her old red shoes that I remember her wearing when I was a child. 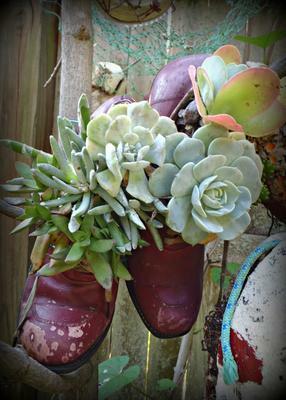 I paired them up with my fav pair of worn out clogs(with lots of holes!~I love things with holes). So in honor of Mom here are OUR SHOES. The mom and daughter shoes is a great idea! It will always make you think of her in a kind and beautiful person she was! A nice tribute to your mom. I always will remember how sweet she treated me. Very nice, Nanette! Very creative! 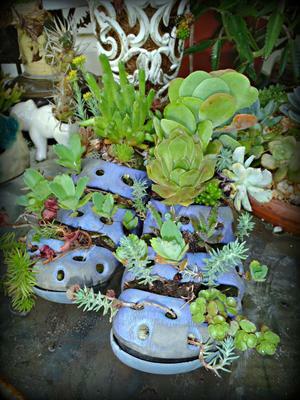 Your mom would love to see what you did with her shoes. Return to Best Succulent Container Contest 2012.